In a season where Stratford is struggling a bit, I haven’t seen a bad Shaw production yet. Ragtime is Fantastic (more on that later) and His Girl Friday is pretty good (again, more to come) but it’s French Without Tears that surprised me the most. I wasn’t sure what I was getting myself into at a show called “strictly comic” by its own program notes (you know, the place where the dramaturg usually explains how incredibly deep everything is). I’d seen Terence Rattigan’s comedy about privileged Brits learning French and falling for the same girl before and hated it, so I wasn’t sure I’d like it this time around. Turns out, the experience of French Without Tears in Massachusetts is vastly different from the experience of it in Ontario; on a very basic level, the French-educated audience gets more of the jokes. 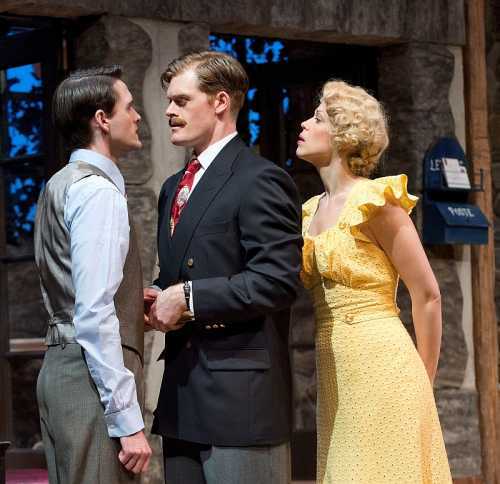 It also helps that the Shaw festival has at their disposal people who actually speak french, and a director who understands the language nuances that make up so much of Rattigan’s style. The Shaw also has a fantastic acting company (something the poor student production I saw way back when most certainly did not). Normally I wouldn’t say The Shaw has great bench depth since their ageing company isn’t generally as strong across-the-board as Stratford or Soulpepper’s. But there are lots of actors at The Shaw I really do like (even more than their Stratford and Soulpepper counterparts), the trouble is that they’re usually in the background, playing second fiddle to annoyingly repetitive folk like Benedict Campbell, Michael Ball, and Deborah Hay (now annoying from Stratford). But French Without Tears is a story about young people so Shaw gets to show off their particularly great young players. Awesome people like Wade Bogert-O’Brien (who owned Candida last year as a supporting actor), Martin Happer (one of the few saving graces of 2011’s Dreadful On The Rocks) and my new Shaw favourite- Ben Sanders (who doesn’t have many great parts on his resume but is Flipping Fantastic here). Compared to something like His Girl Friday (an old-fashioned piece that only sparkles because of its likable leading lady, Nicole Underhay), French Without Tears is incredibly fresh with not only youthful energy but the youthful talent that actually is the company’s best asset. This is The Shaw Festival, so of course the production is staged in written period with stiff British accents, but Rattigan’s script (first produced in 1936 and set in France), like an Oscar Wilde piece, only really makes sense in written period with the characters played linguistically exactly as written. It could be interpreted, with some heavy doctoring, but with the right cast to liven up the proceedings and make everything feel relevant, that shouldn’t be necessary. Normally I’d scold the director for going period (it’s so very Jackie Maxwell of her, which I don’t mean as a compliment) but Kate Lynch does plenty in character interpretation and clever blocking beyond the confines of the text that is funny or poignant or both at any given time. Little details like how she positions the drunken and loquaciously thoughtful men at the beginning of act two reveal Lynch’s singular understanding of how humans (and, specifically, these inexperienced but self-impressed young men) act around and respond to each other. The woman at the centre of the trouble is Diana, played by the hammily alluring Robin Evan Willis. Diana flirts with honest humanity but she mostly tosses such things aside in service of flirtation in general. In love with being loved, Willis plays Diana very big, as though everything from her vocal cadence to her seductive prowl is a well-rehearsed show. Sometimes that choice becomes tiresome but, at least intellectually, it’s a strong one. Diana’s female foil is Julie Martell’s Jacqueline (or “Jack” as she’s fondly called by the man she loves who simply “likes” her). Jack is smart and tough and honest where Diana is full of air. Martell’s French accent is less consistent than the flawless British ones of her castmates but she’s otherwise lovely in the role. Rattigan’s script sometimes lapses into anti-woman foolishness but Jack is the best counterargument there is. 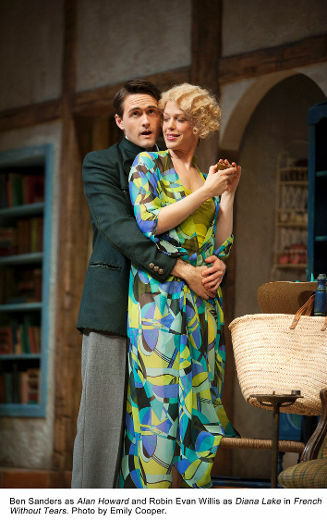 In what I think is an insightful commentary on the straight male brain (and, really, all of our brains), Rattigan lets his male leads consciously want to love Jack while desperately trying to convince themselves not to fall for Diana. As funny as that concept is on stage (on multiple occasions Alan sprints from the stage screaming “Oh my God” when Diana enters unexpectedly), it rings incredibly true, at least with me who’s always wishing the butterflies in my stomach would choose worthier subjects. Alan, Kit and Bill all know Diana is trouble and, more than that, isn’t actually worth their time in the long run (being less smart, less interesting and far less “nice” than Jack) but when she wriggles about and coos in their direction (and, most notably, when she tells them she loves them) they can’t help but come running. That push and pull between hating and wanting Diana is played beautifully by the three leading men. Martin Happer gives a particularly amusing performance as Lieutenant-Commander Rogers (aka “Bill”). He’s half dolt, half goofball and all heart as he slowly eases into something resembling friendship with Kit and Alan. Kit, for his part, is the clueless, sentimental charmer of the group who loves Diana enough to literally fight his romantic rival (Bill) despite being half his size and wearing a skirt. He’s also frustratingly ignorant of Jack’s feelings for him as the two “friends” play out the oldest story in the book and he eventually realizes that Diana doesn’t actually love him so much as love being loved by him. Wade Bogert- O’Brien is just as good as he always is/I knew he could be/trusted that he would be yet again. A master of the love-lorn scamp, Bogert-O’Brien’s Kit is less earnest and ultimately more grounded than last year’s similar-but-different Eugene Marchbanks. 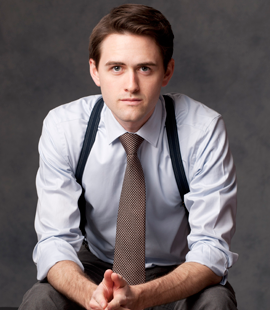 My notes to the two major festivals would be Shaw: please stop assigning women to break Wade Bogert-O’Brien’s heart on stage (his wounded face is just too heartbreaking to handle); and Stratford: ROMEO, 2013! (I cannot stress this enough). But as much as I love Happer and Bogert-O’Brien (as regular readers of this site are tired of hearing, I’m sure), it was Ben Sanders who stood out to me in French With Tears. I’m pretty familiar with the Shaw acting company and have seen most of them before, I’ve even seen Sanders before, but I’d never noticed him before this afternoon- He’s Incredible! How did I not know that?! Alan is arguably Rattigan’s wittiest and most interesting character. I say arguably because you can have different taste than me, but Alan is the smartest, most conflicted, most withdrawn and driest character in his group of wannabe Diplomats and therefore is predictably the one I think is the funniest and most interesting. He’s the leader of the group mostly because of his combination of charisma and aloofness, but he’s also the most impressive (in the sense that he speaks the best French and the other characters say things like “I wish I had your brains”); Alan’s the most trusted and the most observant, making him the one who knows everything and then can release that information in almost puppet-master ways. He pretends to hate Diana, or rather he actually hates Diana, but one word about her loving him and his smart, cool, together demeanor crumbles like a twice-dunked biscotti. Alan’s all about the inner struggle between who he hates being and who he wants to be- he wants to be someone who would never love Diana but she makes him weak in the knees anyway. It’s a truly great role- one of the best I’ve seen in awhile- and Ben Sanders is mesmerizing in it. He has flawless comic timing and the uncanny ability to play 18 different emotions underneath a calm facade. I have no idea how he’s existed on this planet without getting every leading character ever written, or at least without catching my attention before now. I wasn’t expecting it at all, but French Without Tears captured my heart easily and refused to relinquish it (that darn Ben Sanders still has it, and I’ll need it back before 8pm or Come Back, Little Sheba doesn’t stand a chance). The whole thing is an utter delight with an underrated script, subtly clever direction and a cast to die for. Shaw needs to do more like this- kick the old folks out and let the Sanders, the Bogert-O’Briens, and the Happers of the company take over the acting reigns. 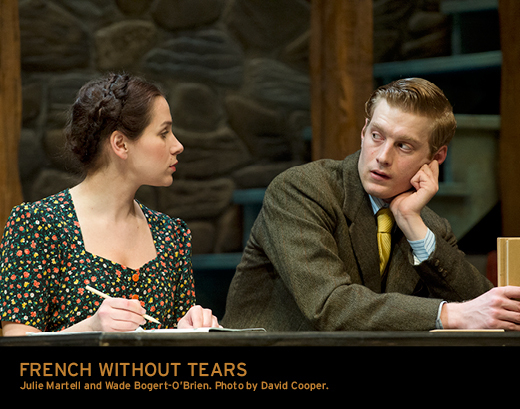 French Without Tears is playing at The Shaw Festival Royal George Theatre until September 15th.